Quick analysis: Consumer litigation, particularly TCPA, has come roaring back after an anemic December 2014. CFPB complaints look flat from November to December, but the December numbers are still likely to increase by a couple hundred complaints as they continue to trickle in. In December, there were 172 TCPA lawsuits (after an inexplicable November dip to 94), down from a 2014 monthly average of 203. FDCPA rebounded to 836 from a 2014 monthly average of 807, and FCRA hit 203, up from it’s 2014 monthly average of 193. Class actions are all over the place this month, with FDCPA normal at 9.2%, FCRA low at 4.9% and TCPA high at 12.8% of all litigation representing a class. Repeat filers represented about 31% of all December litigation. 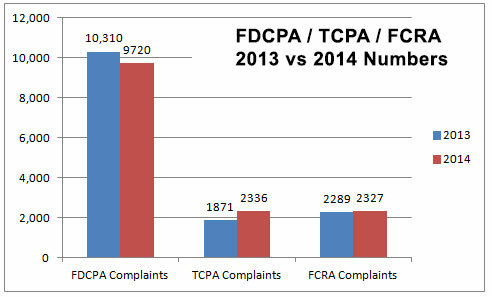 Overall, lawsuits are down, thanks to FDCPA dropping 590 lawsuits from 2013’s total. This marks the 4th year in a row that FDCPA has declined, and it is the first year since 2009 that it is below 10,000. Both FCRA and TCPA are up, making up for most of the shortfall. 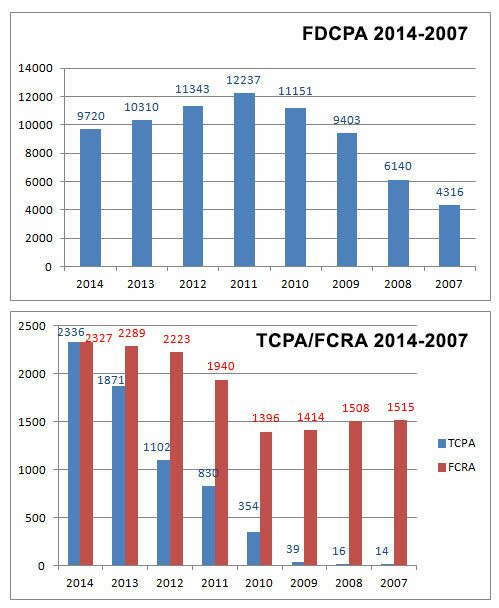 As predicted earlier in the year, TCPA surpassed FCRA in the number of 2014 filings. But due to the November plummet, it was a squeaker. Overall, the 14,383 lawsuits in 2014 came in just below the 2013 total of 14,470. It is likely that this small gap will tighten as more litigation is made public in the weeks ahead, but probably not enough to overtake the lead. For CFPB complaints, it is impossible to draw any relevant comparison as 2013 was the first year debt collection complaints were collected, and it was a partial year. For the record, there were 11,080 complaints against debt collectors in 2013 and 39,185 in 2014 (likely to go up by a couple of hundred as CFPB complaints are still being released to the public). Of those cases, there were about 1094 unique plaintiffs (including multiple plaintiffs in one suit). Of those plaintiffs, about 339, or (31%), had sued under consumer statutes before. About 829 different collection firms and creditors were sued. There were 2843 complaints filed against debt collectors in Dec 2014. This includes 2624 (92%) timely responses to complaints, and 219 (8%) untimely responses. Of the company responses, consumers accepted 0 (0%) of them, disputed 245 (9%) of them, and 2598 (91%) were N\A.